With a FileMaker and QuickBooks integration, you can save time by eliminating double entry, improving data accuracy and giving your users access important QuickBooks related information in FileMaker. By making a connection between FileMaker and QuickBooks, you can use data in FileMaker to automate the creation of invoices in QuickBooks, adjust inventory, create a PO, update a customer, apply a payment or even pull a report. With this plug-in and our QuickBooks Desktop hosting plans the possibilities for integration between these two great programs are virtually endless. If you are using the QuickBooks Online with Windows or Mac, have a look at the FM Books Connector Online plug-in. Try our fully functional demo file for up to 30 days. Please note the demo will expire 2 hours from opening your FileMaker application. To reset the demo, close and reopen your FileMaker application. Visit our Help Center for a full list of FAQs and product documentation, submit a question on our PCI FM Forums page, or view videos on our YouTube channel. 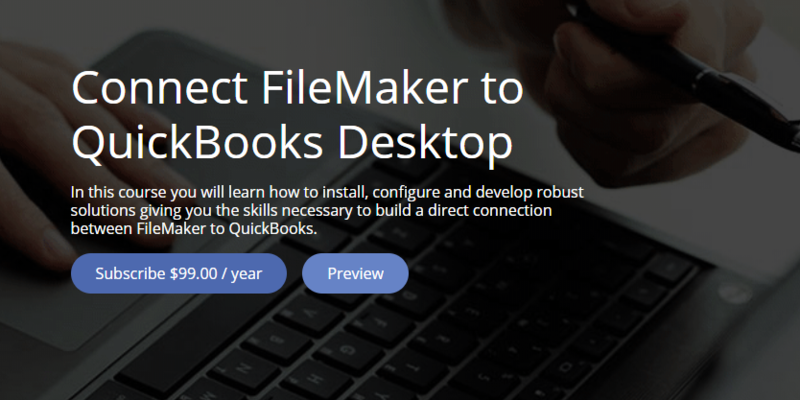 Learn how to integrate FileMaker and QuickBooks Desktop using the FM Books Connector plug-in with Productive Computing University’s new course Connect FileMaker to QuickBooks Desktop. We have designed a six-hour training course to teach you how to install, configure and develop robust solutions. With this course, you will learn the skills necessary to build a direct connection between FileMaker to QuickBooks. This plug-in is verified compatible with FileMaker Pro 15 - 17 (32-bit and 64-bit), Windows® 7/8/10 and may work with earlier versions. The 32-bit version of FM Books may work with earlier versions of QuickBooks. *Intuit's QuickBooks is a 32-bit application, but this plug-in works with FileMaker 32-bit and 64-bit. Resolved an issue where using PCQB_RsUseXML to load an XML document while not in an active QuickBooks session would return a warning log if logging is enabled. Added extra handling to PCQB_RqAddFieldWithValue to properly handle a date or timestamp field value that has already been formatted to QuickBooks standards. Resolved an issue where the plug-in splash screen does not accurately report how long the demo registration has left. Added support for FileMaker Pro 13. Please review page 31 of the Developer's Guide for specific information on this version for FileMaker 13 compatibility. Set validation attribute to "true" by default - validates XML when executing requests. Updated Registration URL to "licensing2.productivecomputing.com"
Added support for QuickBooks 2013 US, UK, Canadian, and Australian Editions. Added support for QuickBooks Online Edition. Set validation attribute "false" by default - does not validate XML against XSD files when executing requests. Updated script for invoice pushing. Added support for QuickBooks 2012 Canadian version. Fixed issue where RqExecute would return "End" when successfully processing a "TxnDisplayMod" request. The executed request now properly returns "0" for success instead of "END." The PCQB_ZValidateXML function is now fixed to return "!!ERROR!!" when the XML is malformed. Added third optional parameter of (optWellFormedOnly) to the PCQB_ZValidateXML function. The default value is False. Set it to true if you want to only test if the xml passed to the function is well formed, leave it empty or set to False if you want full validation against the QBXML templates. Change PCQB_ZParse function to omit n character. Changed location of PCI registration file for support with FileMaker 10. PCQB_ZParseXML Loads an XML document into memory and applies the XPath query to the document. Supports extra parameter in LicenseID ( licenseID "|"
fixed the index of the first record to properly increment on the first call to PCQB_RsOpenFirstRecord. PCQB_ZParseXML - loads an XML document into memory and applies the XPath query to the document. Add extra functions and parameters for working with stored XML files. PCQB_SFormatString returns the input string formatted to the desired QB format. This fully functional demo file is usable for 30 days. However, the demo will expire 2 hours from opening your FileMaker application. To reset please close and reopen your FileMaker application. The FM Books Connector Mac Template is for development purposes only. For full functionality to communicate directly with QuickBooks for Windows the full version of the FMBooks Connector plug-in is required. Unfortunately, communication of any kind to the Macintosh version of QuickBooks is not available since Intuit does not have a Mac compatible Software Development Kit (SDK). Successful integration of FileMaker plug-ins requires the creation of integration scripts within your FileMaker solution. Intermediate to advanced experience with FileMaker Pro, especially in the areas of scripting and calculations, is necessary to integrate this plug-in. After review of our overview videos, sample scripts and documentation you find you need assistance please contact us or fill out a Request For Quote. Ready to get started now - try our Core5 Starter Edition! Core5 comes pre-configured with 30-day trial versions of the FM Books Connector or FM Books Connector Online plug-ins and is designed to integrate with your existing QuickBooks company file (Desktop or Online). Core5 allows you to pull your existing QuickBooks contacts and items in order to set up your file, as well as continually push customer and invoices and pull payment balances. Have your own solution but need to integrate with QuickBooks Online (Windows or Mac), please see the FM Books Connector Online plug-in.